I came home yesterday to this waiting in my mailbox for me. In case you were wondering, it was a thank you card for a baby shower. 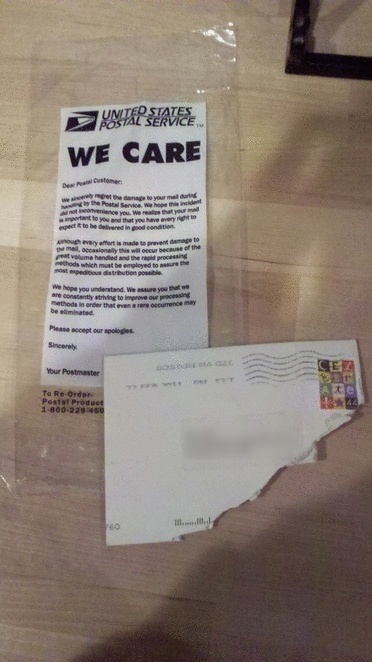 The note on the bag goes on to apologize for the inconvenience caused by their tearing my mail to shreds. You see, the USPS processes so much mail, they can’t possibly do it correctly every time. Clearly, this little guy got stuck in some processing machine. Poor thing. I’m imagining that an unassuming postal worker tried to pull it out, much like I would at the copy machine and we all know how well that works. But it’s okay, because the USPS? They care. This entry was posted in The World These Days and tagged damage, inconveniences, postal service. Bookmark the permalink. 1 Response to We Care. HAHA awe! Well at least they still delivered it! I love hearing those news stories about how a letter was found behind a machine in the post office from 1944 and they still deliver it to the recipient and it turns out to be a big love letter from a soldier or something. But I digress….